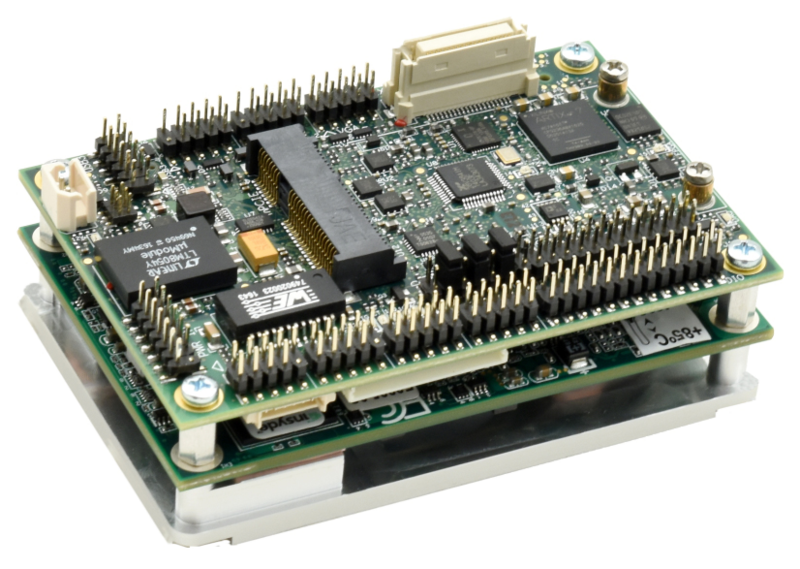 Sunnyvale, California — November 14, 2017 — Today Diamond Systems Corporation, a leading global provider for rugged, I/O-rich embedded computing solutions, unveiled its ultra-small COM-based ZETA single board computer family. Highlights of the Zeta family include interchangeable COM Express COMs for scalability and long product life, ultra-compact size, and an unsurpassed level of I/O, including a complete high-quality analog and digital data acquisition subsystem. Designed in the COM Express Mini Type 10 form factor (84×55mm / 3.3×2.2in), the Zeta family offers performance scalability due to its use of COM Express CPU modules. Zeta’s two-board COM + baseboard construction yields the highest feature density possible in a given footprint. The COM provides the core CPU functions, while the baseboard provides the «final inch» for all the system I/O plus the data acquisition subsystem, power supplies, and expansion sockets. Zeta provides as much as a 60% reduction in size compared to boards in larger form factors offering the same level of I/O. Zeta is available in two I/O configurations, digital I/O only or digital + analog I/O. The DIO only circuit offers 16 DIO lines with selectable 3.3V/5V logic levels. The full circuit includes 16 channels of 16-bit A/D, 4 channels of 16-bit D/A, 27 digital I/O lines with selectable 3.3V/5V logic levels, and 8 32-bit counter/timers, all supported by Diamond’s free, industry-leading Universal Driver™ data acquisition programming library. An interactive graphical control panel for Windows and Linux is also provided to control all data acquisition features. Zeta offers multiple options for system expansion and mass storage. It includes a PCIe Minicard / mSATA socket and a micro-SD socket. A unique expansion connector enables the installation of a daughterboard that contains an M.2 SATA SSD socket, a second PCIe Minicard socket, HD audio, and 16 additional GPIO lines. Zeta’s built-in heat spreader efficiently removes heat from the SBC to keep the processor and all internal electronics cooler for improved reliability. The bottom-side mounting configuration of the heat spreader provides a secure and convenient mounting system for the board. It also simplifies the installation of I/O expansion modules by eliminating interference or airflow problems that can occur with traditional heat sinks. All three models of Zeta are tested for operation over the full industrial temperature range of −40°C to +85°C, making Zeta an ideal choice for vehicle applications. Complete development kits consisting of the selected CPU, a flashdisk with either Windows 10 or Linux OS installed, and a cable kit are available to accelerate your development effort. Founded in 1989 and based in Sunnyvale, California, Diamond Systems Corporation is an innovative provider of compact, rugged, board- and system-level real world embedded computing solutions to companies in a broad range of markets worldwide, including transportation, energy, aerospace, defense, manufacturing, medical equipment, industrial controls, and research. The company is recognized as an innovator of embedded I/O standards and technologies; it originated the FeaturePak I/O modules standard, was an early adopter of PC/104 module technology, and holds a patent for a unique analog I/O autocalibration technique.